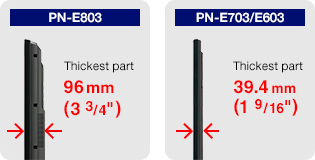 PN-E803/E703/E603 LCD panels incorporate Sharp's UV2A* technology, which prevents light leakage and ensures highly effcient use of light from the backlight. Thanks to this technology, the monitors achieve truly bright whites and extremely deep blacks. All three models support full-HD (1920 x 1080 pixel) resolution, for beautifully clear rendering of detailed text and graphics. 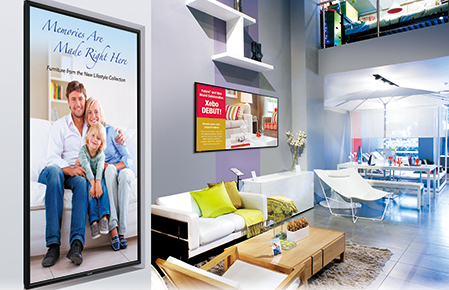 The choice of three screen sizes—80, 70, or 60 inches—means you can select the high-quality professional LCD monitor that's right for the type of content you plan to show and for your specific installation purposes. 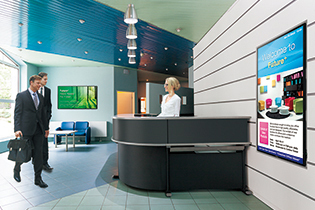 These monitors can be installed in either a landscape or a portrait orientation. Portrait mode offers the look and impact of a poster, while landscape mode puts wide images on vivid display. Optimise your choice and maximise your audience impact. With Mirror Display mode, the same image can be displayed on a daisy chain of PN-E803/E703/E603 monitors for the powerful impact of image repetition. 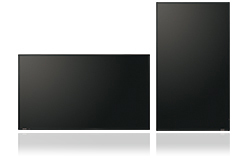 A maximum of 25 monitors* can be daisychained via DisplayPort, and up to five monitors via DVI-D cable. * Up to 25 for non-HDCP-encoded content; four for HDCP-encoded content. Compared to conventional CCFL backlighting, LED backlighting on the PN-E803/E703/E603 monitors helps ensure reliable performance with low power consumption—roughly 55% less energy use for the PN-E603 and 44% less for the PN-E703. can be easily controlled and monitored from a central location via a PC. Each monitor can be assigned an individual ID code that specifies it when remotely turning it on or off, switching its input, or making various screen adjustments and settings to it.